You can't go wrong serving a Delightful Pastries pie to guests. Delightful Pastries offers a variety of fresh fruit and cream pies including Rhubarb Strawberry, Rhubarb Meringue, Apple Caramel, Banana Cream, Chocolate Cream, Key Lime, and Chocolate Coconut among others. Order early and pick up a few at any of its three Chicago area locations. Pies will serve 8-10 people and range in price from $20-$27 each. Can't decide? 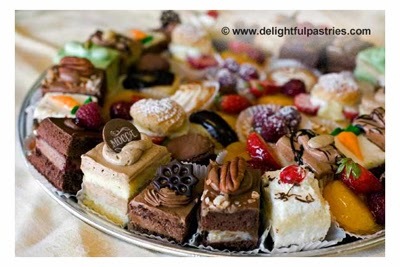 Delightful Pastries offers a wonderful mixed mini pastries tray including an assortment of éclairs, fruit tarts, cream puffs, chocolate cups, mini tortes, tira mi su, truffles, and more,, $40 for small try; $80 for large. Pies available at all three Delightful Pastries locations: Old Town at 1710 N. Wells St., (312) 255-0724; Jefferson Park at 5927 W. Lawrence, (773) 545-7215, and Chicago French Market at 131 N. Clinton, (312) 234-9644. Visit http://www.delightfulpastries.com for more information. Delicious Michigan rhubarb tossed with strawberries and topped with cinnamon streusel. A sweet and tart concoction for those that love the marriage of rhubarb and meringue this is your pie. 2.5 pounds of Michigan apples tossed with our house made caramel. Bananas topped w/ a delicious vanilla bean custard, topped w/ mounds of whipped cream and white chocolate shavings. Chocolate pastry cream made w/ chocolate, topped w/ whipped cream & dark chocolate shavings. 10" deep dish pie. Made w/ Joe and Nellie's Key Lime Juice. Serves 14-16 people. Gluten FREE pie with coconut shell and filled w/ ganache. An assortment of éclairs, fruit tarts, cream puffs, chocolate cups, mini tortes, tira mi su, truffles, etc.